The Ford F-250 Super Duty is a tough-as-nails heavy-duty truck. It packs a colossal towing capacity and an equally impressive payload rating. But there’s another side to the burly work rig. When properly equipped, it offers high-tech gear and amenities that would put most luxury cars to shame. Since you work hard day in and day out – think of the F250 as a reward for all your efforts. For 2019, the Ford F-250 Super Duty carries on mostly unchanged. The exception is the addition of a new Lariat Sport package, which adds running boards, 20-in. wheels, a spray-in bed liner, and black exterior trim. Also, the Lariat gets a new B&O Play stereo. The forthcoming model is offered in six trim levels: XL, XLT, Lariat, King Ranch, Platinum, and Limited. Cab configurations include regular, SuperCab and CrewCab. Bed options include either a 6.8 ft. length or an 8.2 ft. length. Bold doesn’t begin to describe the look of the square-jawed Ford Super Duty truck. The full-size pickup features a body made from high-strength aluminum, along with a massive chrome front grille and unique headlights. Everything sits on top of a fully-boxed, high-strength frame. Inside, CrewCab models provide plenty of room for five passengers. Nearly every amenity you can think of is offered onboard – from full-leather upholstery to power-adjustable pedals. There’s also an available panoramic sunroof for fresh air enjoyment. The cargo area is equally well-designed with available BoxLink, LED box lights and a power-operated tailgate. The Ford F-250 Super Duty was made to haul, pull and get the job done. A lineup of durable powertrain options provides that capability. Engine choices include either a 6.2L gasoline V8 engine (385 hp and 430 lb.-ft.) or a stump-pulling 6.7L diesel V8 (450 hp and 935 lb.-ft.). Both engines are paired with a 6-speed automatic transmission. Rear-wheel drive comes standard, while four-wheel drive is an option. An available locking rear differential provides even more capability when the going gets tough. 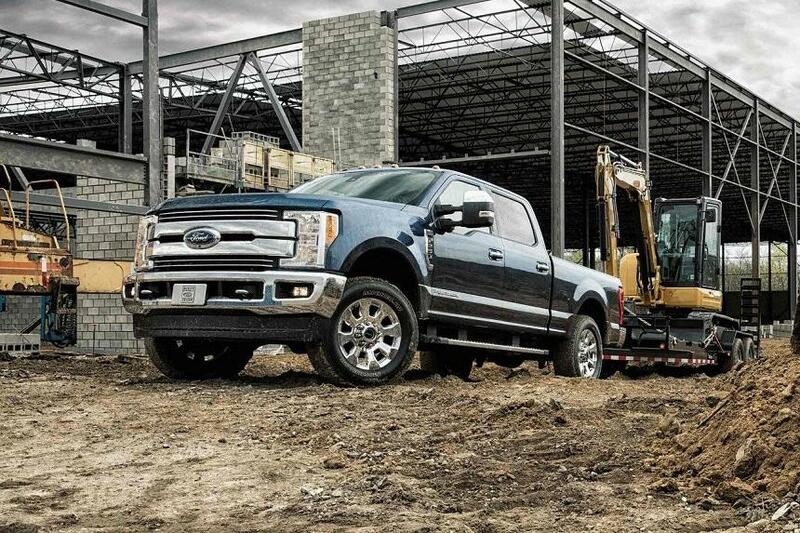 When properly equipped, the F-250 offers a towing capacity of 17,500 lbs. Payload is as much as 3130 lbs. Further capability is provided by an available Ultimate Trailer Tow Camera system (with seven cameras) and diesel engine braking. And for really-big loads, there’s a fifth-wheel/gooseneck hitch prep package. There’s no shortage of advanced equipment offered onboard the F-250 Super Duty. An available SYNC3 touch-screen infotainment system (complete with Apple CarPlay and Android Auto) sits prominently in the middle of the dash. Further connectivity comes from in-vehicle WiFi and multiple USB ports. Plenty of safety and driver assistance functions can also be had. Highlights include a 360-degree surround-view camera, adaptive cruise control, lane keeping assist, and blind spot monitoring with rear traffic alert. The 2019 Ford F-250 is coming soon, to South Bay Ford Commercial. Stop by today to learn more about this long-lasting pickup truck and to schedule a test drive. You’ll be amazed to find out what it can do for you.